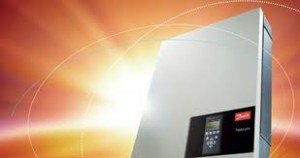 Danfoss Solar Inverters is now part of the German based SMA Company. Danfoss acquired 20% of SMA’s shares with a value of €302 million in return for selling its inverter units. PnP can sill service and repair most of these units but SMA now handles all technical support. SMA technical helpline +44 1908 304899 This line is staffed between 08:00 and 16:00 GMT Monday to Friday. The Danfoss Solar Inverters have been designed to save time and costs on installation and offer optimal inverter sizing for PV installations. Establishing the correct ratio between PV module power capacity and inverter power capacity is one of the key criteria for optimised PV power plant design. Under-sizing the inverter can lead to frequent “derating” of the PV power plant where, for example, the inverter moves the operating point away from MPP. This results in less PV powerplant yield than is actually possible. On the other hand, over-sizing the inverter leads to unnecessary costs.and use multiple individually regulated MPP trackers in the ULX (single phase) and TLX (3 phase) range. Now it’s possible to design systems with different angles, orientation or different numbers of modules per string, using just one inverter. You can realise any system from 1 kW to 17 kWp.